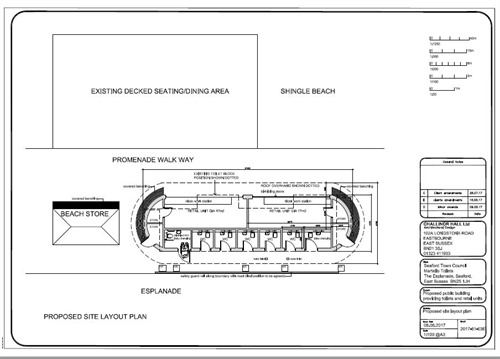 New Seafront toilets - Have your say! Seaford Town Council is pleased to confirm that new toilets are to be constructed on the site of the existing Martello toilets over the winter period. 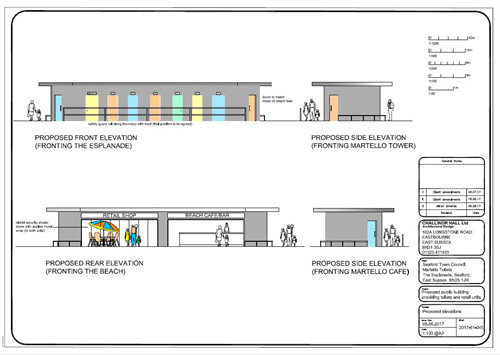 The design of the building is in keeping with the surroundings using coloured render of a similar colour to the next door Martello Tower with the toilet doors reflecting the colours of the nearby beach huts. The new facility will be of a much higher standard than the existing facilities with higher quality sanitary ware and two kiosks replacing the existing kiosk which will be relocated to one of the new units. The second kiosk will be rented out to a new business which must be complimentary and not competing with the existing one there. The new toilets will be cleaned on an increased basis with extra on site cleaning during very busy periods to ensure the high standards are maintained. They include a dedicated disabled toilet which will be accessed via laser key holders free of charge. The remaining toilets will have a charge of 20 pence. This is to enable additional cleaning to take place and it also deters vandalism and misuse of the facilities which will also have CCTV all around the outside of the building. The Town Council will consider the final design at its meeting on the 31st August following which the tender will be issued to construct the toilets over the winter period.